The locals and expats used to turn up their noses at the very mention of this 800 metres long strip of flophouses, retail outlets and travel agencies, frequented by impoverished tousle-haired backpackers wearing toeless shoes and shorts. But nowadays better-dressed, better-off and altogether a better proposition. 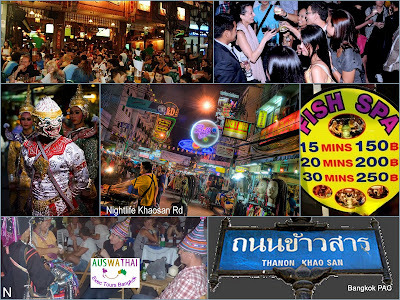 Backpackers still visit Khaosan in their thousands and dominate the scene both by day and night. But after sunset, when the neon lights flicker into life, and the entertainment establishments open their doors, the area takes on a new dimension. Office workers, students with money to spend and freelance. The Ferry (River or Canal) or close but close at 8pm. Taxi/tuktuk or M.Bike in the evening rush-hour is risky, not all drivers are keen because of traffic gridlocks. By 9 pm. however, access shouldn't be a problem.